Worrying can become as much a habit as biting your nails. We can find ourselves doing it without realising it. 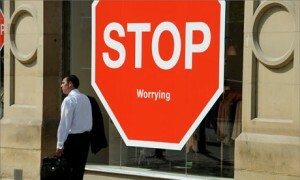 Worrying excessively can eat away at our self confidence which doesn’t help when we try to take control of what ails us. 1. Identify the actual worry and be as specific as possible. What do you think is going to happen as a result of this worrying? Are you just generally worrying about things outwith your control? If your worry is something you can’t control you may need to remind yourself that worrying won’t help at all.Worrying is a passive activity, however, your worry might stimulate you into doing something positive about your concern so it’s is not all bad as long as you stay in control. 2. Ask yourself is there anything I can do about this worry right at this minute? If the answer is yes, do it or plan to do it. If the answer is no, write down your worry and resolve to look at it at another time and see if there is anything you can do then. In effect, schedule in your worry time! 3. If the worrying persists learn a technique to distract your mind. Distraction is helpful in many areas, like managing pain or controlling unhelpful habits. Worrying has quite possibly become a habit for you so you need to fill the gap the worrying habit will leave. You could try mindfulness or meditation, knitting or some other craft (you could make a worry scarf!). What’s your best tip for managing worry?